This patient in her 40's wanted a transformation of her lower body. Dr. Ricardo Rodriguez performed a lower Body Lift (or belt lipectomy) procedure at GBMC hospital in Baltimore, Maryland. In addition to excess skin removed, Dr. Rodriguez removed a total of 1100 cc of adipose fat with liposuction. The surgery lifted the buttocks and flattened the stomach area, resulting in a dramatic change of the patient's figure. Getting the best results comes from taking out the right amounts of fat and skin. It is not proper to take out too much skin or too much fat. 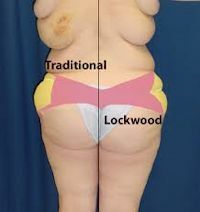 Dr. Rodriguez believes that the Lockwood technique provides the best method for excising precisely the right amount of fat and skin. Read more about that here.